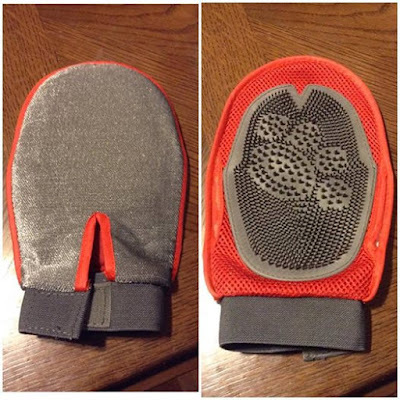 This is a really nice grooming glove to use on your pet. It can be used either wet or try. One side has nubs which are good for brushing, as well as washing your pet for a deep down clean. The other side is soft and is good for getting fur off of your upholstery. The mitt can be worn on the left or right side which makes this great for almost everyone. It has a velcro closure so you can have the right fit on your wrist. Your pet can have the whole salon feel. You can find this pet groomer on Amazon. What Chillaxed Pet has to say about their product. This handy glove-style grooming brush is designed for short- or medium-haired pets. This soft glove has flexible rubber tips that gently remove hair, dirt, and tangles and reduce shedding while giving a soft massage. Glove can also be used for bathing. Reverse side of glove is designed to pick up loose fur from fabric and upholstery. Turns grooming time into bonding time that both you and your pets will love! Disclosure: MarksvilleandMe received one or more of the products mentioned above as part of a promotion with Tomoson and Chillaxed Pet. Regardless, MarksvilleandMe only recommends products or services we use personally and believe will be good for our readers. Some of the links in the article may be “affiliate links.” This means if you click on the link and purchase the item, I will receive compensation. If you would like MarksvilleandMe to review a product or service please contact us at marksvilleandme@gmail.com.